Dubai national carrier Emirates is set for its largest participation yet at this year's Bahrain International Airshow (BIA) to be held from November 14 to 16. 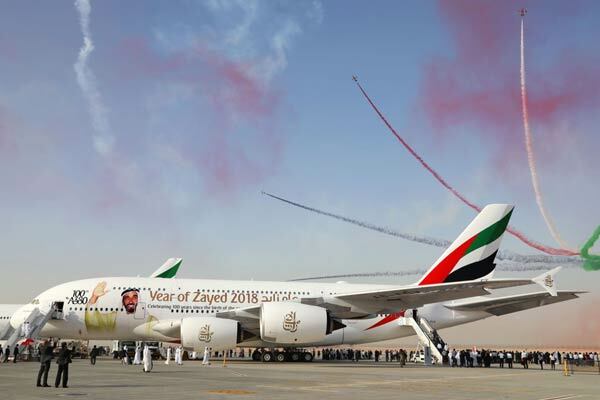 This is the first time the airline will showcase its 100th A380, which is emblazoned with the Sheikh Zayed decal as a tribute to the late founding father of the UAE. The aircraft on display will allow both trade visitors and the general public to explore all the features on this latest generation double-decker, including Emirates’ refreshed OnBoard Lounge, said a statement from Dubai carrier. The Emirates Flight Training Academy, which was inaugurated one year ago at the Dubai Airshow, will also participate at this year’s event with an Embraer Phenom 100EV jet on display, one of the Academy’s twin-engine training aircraft. The Academy is a state-of-the-art facility that was developed by Emirates to meet the global aviation industry’s requirement for skilled commercial pilots. It provides advanced learning technologies and training aircraft to help training cadets develop and sharpen their flying knowledge and skills. Emirates Executive VP and COO Adel Al Redha said: “The Bahrain International Airshow is an important event for the aviation and aerospace community, both regionally and on an international level." "The Emirates A380 and Phenom 100EV being showcased during the Airshow demonstrate our commitment to the Kingdom of Bahrain and highlight Emirates’ contribution to the growth and development of aviation in the region,” he stated. Anticipated to be popular with aviation enthusiasts as well as the general public visiting the Bahrain International Airshow, the Emirates A380 will feature 14 luxurious First Class suites, 76 flatbed seats in Business Class and 429 spacious seats in Economy Class, as well a refreshed Emirates’ OnBoard Lounge. Since the new OnBoard Lounge went into service in August last year, it has wowed customers with more seating options, mood lighting, modern finishes, and other technological features. Emirates is the largest operator of the A380, flying this popular aircraft to 50 destinations around the world. Recently, the airline launched new scheduled A380 services to Hamburg and Osaka. The airline currently has 105 A380s in service and has a further 57 on order, said the airline.